I have been asked a number of questions since I started the Saab 9000 page. While I always like to answer these questions personally, I decided it was a good idea to place the questions and answers on the web site as well. Much of the information has been supplied by others. If you have any questions not listed here, or you find that the answers to those listed are inadequate or inaccurate, pllease let me know and I'll try to add something appropriate. What are terms like "brake discs", "bonnet", "dipped/main beam", etc.? They sure ain't English! They are English. They just ain't American. I use UK English terms because those are the ones I am familiar with. If I tried to use US English, I would forget myself at times and wouldn't apply it consistently. Also, then my UK readers would get confused. I have put together a UK/US English glossary here. Where do you get the "T40 Torx® bit" used for the screw on the front brake disc? I got mine as part of a socket set from my local car accessory shop (Halfords in the UK). I'm told that US readers can find them at "Discount Auto Parts", among other places. There is a variety of sizes of Torx® screw used in the 9000 and it may be useful to buy a set. Do you use a torque wrench on your wheel bolts? I've never seen a spec anywhere on this but it seems to make sense. What do you guess the torque spec would be? I do use a torque wrench on them. The official torque figure listed in my Saab 9000 Owner's Manual (1996) is 120Nm (90lbft). Do you use Lock Tight on all your bolts? No, not on all of them. It's a hassle on bolts that don't need it, both applying it when screwing them in and not being able to unscrew them easily once I've loosened them off. I only apply it when I've seen instructions to do so, like I did for the caliper carrier bolts, or if I think the bolt will suffer vibration that might shake it loose. The obvious answer is that it is grease with copper in it. However, it is also known as "anti-sieze" compound. 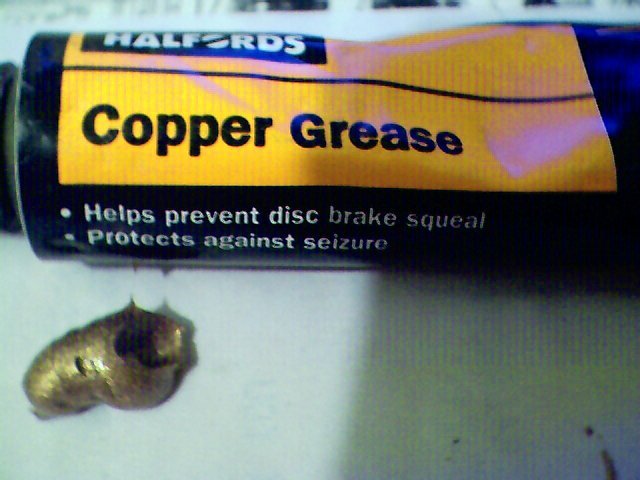 It is often used on the back of brake pads to cushion the pad and stop brake squeal, hence my local accessory shop keeps it on a shelf next to the brake pads/shoes. It is also useful to stop bolts siezing, especially at high temperatures where the grease melts and disappears, but the copper stays put. e.g. I recently fitted an oxygen sensor and it comes with a little sachet of copper grease to lubricate the threads so I won't have trouble unscrewing it from the exhaust downpipe in umpteen years time. See the picture below to see what I mean. You probably won't be able to get "Halfords" brand outside the UK, though, since that's my local accessory shop and is a UK chain. Another famous brand in the UK, and a name often used to refer to it generically (like Hoover) is "CopaSlip" (a trademark of MolySlip).